This week the Queen opened UK parliament. The Queen’s Speech IS NOT a sequel to the recent Oscar winning Hollywood Movie. Instead it sets out the legislative agenda for the next parliamentary session. Crime and punishment featured heavily in this years Queen’s Speech. The UK press widely reported the creation of a new fangled National Crime Agency (NCA) which has been described as a US Style Crime Agency replacing the Serious Organised Crime Agency (SOCA). SOCA itself was originally branded the UK’s version of the FBI when it was originally unveiled six years ago (though in fact it is not). We have not seen this reported elsewhere. If true, it puts back on the table a suggestion originally tabled a couple of years ago after the election of the Coalition government. A proposal the FSA and the SFO successfully fought off at the time. Folding the SFO into the NCA also runs counter to statements in recent days from the new Director of the SFO, David Green QC, who has pledged that the SFO is here to stay. A rebrand or change in location of an agency is unlikely to make much difference. The key is the law. The Bribery Act marked a significant change in the application of criminal law to corporations. That must now be followed by Deferred Prosecution Agreement legislation and related amendments in order for there to be a significant change in the current enforcement success statistics. In the meantime, the possibility of more ‘See Saw Marjorie Daw’ economic crime fighting risks being counter productive. 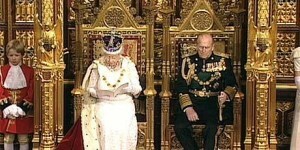 For any fans of UK pomp the Queens Speech in full here!